Rajasthan is synonymous with royalty, luxury and beauty and all these adjectives clearly reflect in the monuments built by the erstwhile Maharajas of the state. The rich heritage in the form of palaces, forts and havelis left behind by the Maharajas has now been converted into luxurious heritage hotels. 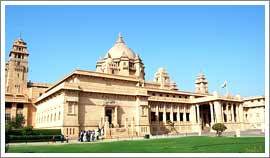 Rajasthan is the proud state of India housing maximum number of heritage hotels. The opulent heritage hotels clearly reflect the inclination of the then Maharajas towards a life style enveloped in luxury and beauty. Stay in these heritage hotels to spend some quality time in a regal ambience. It is undoubtedly going to be a different experience altogether. The treasured memories of your stay here will remain etched in your heart forever. A wide variety of heritage hotels ranging from less expensive to highly expensive ones are available catering to the different budgets of tourists. Each one of the heritage hotels has its own unique charm. They are done up to perfection in an attempt to make the travelers experience the grandeur of the yesteryears. The hosts here are very hospitable and consider guests as God. They know the art of making the stay of their guests not only comfortable but pleasurable too. They are at your service throughout your stay. At most of the heritage hotels, the royalty begins at the entrance of the heritage hotel where you will be received by turbaned personal attendants wearing a warm smile on their face which is followed by the royal music of trumpets. Beautifully decorated elephants are also there to welcome you. How great! Stroll through the interiors of the heritage hotels and you are sure to get bowled over by their lavish aura. The interiors of these hotels boast of meticulous glass work, brightly colored ceilings, antique furniture and royal paintings. Some of the renowned heritage hotels are Lake Palace, Devigarh Palace, Umaid Bhawan Palace, Ajit Bhawan and Rambagh Palace. Come with us and spend a few days in the lap of luxury!